Regular meals keep kitty's blood sugar at the right level. She might look like a cute miniature version of her mom, but a kitten has a lot of developing to do before she's in the clear, healthwise. Because her body is not totally developed, she can suffer permanent damage from hypoglycemia. Seizures, coma and even death can result. To put it simply, hypoglycemia is low blood sugar. It is not diabetes. In diabetes, the blood sugar gets too high and must be carefully controlled. Low blood sugar, however, can be just as dangerous. The entire body, including the brain, relies on energy from blood sugar, and when levels drop too low the body cannot function properly. Little whiskers, little paws, little wet noses and little bushy tails on the outside make kittens irresistible. On the inside they're just as little, and a kitty's liver is not very well developed. Since the liver is responsible for keeping the blood sugar level steady, a kitty's little liver can't make up for a lack of sugar or energy like an adult's. This means going a little too long between meals, too much stress, an infection or any other physical problem that a full-grown cat might easily overcome could easily lead to hypoglycemia for a young kitten. Whether your kitty is perfectly healthy or having some health problems, she can suffer from hypoglycemia if she doesn't get regular meals. Two or three meals a day might be fine for an adult, but kittens need to eat every two or three hours. She's really not a little piglet, but she needs constant energy since her body can't store it very well. Steady, round-the-clock meals keep blood sugar levels steady and prevent hypoglycemia. Going too long between meals is almost a sure-fire way for kitty's blood sugar to drop to a dangerous level. 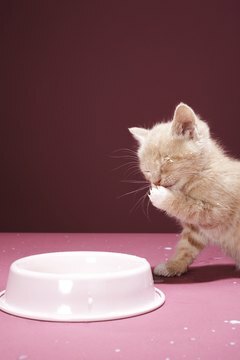 Weaning makes it hard for your kitten to keep blood sugar levels stable. For the first time, a kitten has to give up mom's milk and eat on his own. If he gets too busy playing and forgets to eat regularly, or if he expects mom to feed him and doesn't know what to do when she won't, his blood sugar levels can plummet. Adjusting to a new food and new schedule is hard on all of his body. Keep a close eye on your kitty during weaning for signs of hypoglycemia. One minute your kitten is fine and the next she might be unsteady on her feet and appear dazed. Hypoglycemia symptoms can show up suddenly and they can be serious. Seizures, tremors or collapsing are among the most serious symptoms. Others include unusually cold feet and ears, lethargy and depression. Kitty may also appear to be drunk, stumbling around in a state of confusion. Quick treatment really does mean the difference between life and death when your kitty is suffering from hypoglycemia. Keep a bottle of corn syrup on hand: When symptoms appear, there isn't time to go buy one. Rub a few drops of the syrup on kitty's gums and call the veterinarian immediately. If you don't have corn syrup, use regular pancake syrup, fruit juice or any other liquid that is high in sugar. It is more important for treatment to be quick than to waste time finding the right sugary substance. The idea is to quickly get some sugar back into your kitty's bloodstream before any serious brain or organ damage occurs. Be careful not to put too much into the kitten's mouth or she could choke. Just rub a little bit into the gums.